"Meaning business" is a tactic whereby the adversary surrenders immediately in fear of the possible consequences, but there are a couple of problems with that thinking. The first is that an opponent who can resist will sometimes balk and create a continuing problem for the United States, which has a demonstrated inability to start and end wars in any coherent fashion. This tendency to get caught in a quagmire in a situation that might have been resolved through diplomacy has been exacerbated by the current White House's negotiating style, which is to both demand and expect submission on all points even before discussions begin. That was clearly the perception with North Korea, where National Security Adviser John Bolton insisted that Pyongyang had agreed to American demands over its nuclear program even though it hadn't and would have been foolish to do so for fear of being treated down the road like Libya, which denuclearized but then was attacked and destroyed seven years later. The Bolton mis-perception, which was apparently bought into by Trump, led to a complete unraveling of what might actually have been accomplished if the negotiations had been serious and open to reasonable compromise right from the beginning. Trump's written demand that Kim Jong Un immediately hand over his nuclear weapons and all bomb making material was a non-starter based on White House misunderstandings rooted in its disdain for compromise. The summit meeting with Trump, held in Hanoi at the end of February, was abruptly canceled by Kim and Pyongyang subsequently accused Bolton and Secretary of State Mike Pompeo of making "gangster-like" demands. The second problem is that there are only a few actual casus belli situations under international law that permit a country to attack another preemptively, and they are usually limited to actual imminent threats. The current situation with Venezuela is similar to that with North Korea in that Washington is operating on the presumption that it has a right to intervene and bring about regime change, using military force if necessary, because of its presumed leadership role in global security, not because Caracas or even Pyongyang necessarily is threatening anyone. That presumption that American "exceptionalism" provides authorization to intervene in other countries using economic weapons backed up by a military option that is "on the table" is a viewpoint that is not accepted by the rest of the world. In the case of Venezuela, where Trump has dangerously demanded that Russia withdraw the hundred or so advisers that it sent to help stabilize the country, the supposition that the United States has exclusive extra-territorial rights is largely based on nineteenth and early twentieth century unilaterally declared "doctrines." 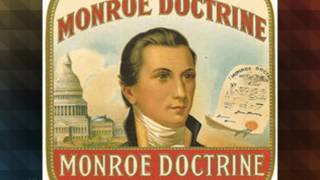 The Monroe Doctrine of 1823 and the Roosevelt Corollary of 1904 de facto established the United States as the hegemon-presumptive for the entire Western Hemisphere, stretching from the Arctic Circle in the north to Patagonia in the south. John Bolton has been the leader in promoting the Monroe Doctrine as justification for Washington's interference in Venezuela's politics, apparently only dimly aware that the Doctrine, which opposed any attempts by European powers to establish new colonies in the Western Hemisphere, was only in effect for 22 years when the United States itself annexed Texas and then went to war with Mexico in the following year. The Mexican war led to the annexation of territory that subsequently became the states of California, New Mexico, Nevada, Utah, Arizona and Colorado. In the same year, the United States threatened war with Britain over the Oregon Territory, eventually accepting a border settlement running along the 49th parallel. Meanwhile the march westward across the plains continued, forcing the Indian tribes back into ever smaller spaces of open land. The US government in the nineteenth century recognized some Indian tribes as "nations" but it apparently did not believe that they enjoyed any explicit "Monroe Doctrine" rights to continue to exist outside reservations when confronted by the "manifest destiny" proponents who were hell bent on creating a United States that would run from the Atlantic to the Pacific Ocean. The Roosevelt Corollary of 1904 amended the Monroe Doctrine, making it clear that the United States believed it had a right to interfere in any country in the western Hemisphere to maintain good order, which inevitably led to exploitation of Latin American nations by US business conglomerates that could count on a little help from US Marines if their trade agreements were threatened. In 1898, Washington became explicitly imperialist when it defeated Spain and acquired effective control over Cuba, a number of Caribbean Islands and the Philippines. This led to a series of more than 30 interventions by the US military in the Caribbean and Central America between 1898 and 1934. Other states in the region that were not directly controlled by Washington were frequently managed through arrangements with local autocrats, who were often themselves generals.